The SBS-H2 Hydrogen Detector is a hydrogen detection system with visual and audible alarms and 1% and 2% hydrogen relays. The system comes complete with the main control, a highly accurate hydrogen gas sensor and a 25 ft. cable. This unit can be powered with AC and/or DC power and can be mounted directly to a wall or to an electrical box, making it extremely versatile and very user-friendly. 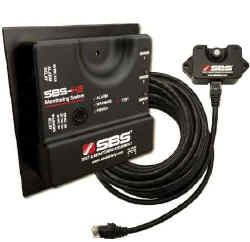 The SBS-H2 includes relays for remote connection to alarm/monitoring systems and for control of external relays or an exhaust fan.